Over 7,000 structures were destroyed in the October 2017 fires in Napa and Sonoma Counties, most of them homes. This page provides information and resources for people who are rebuilding, so that their homes can be safer, more energy efficient, and less expensive to operate. 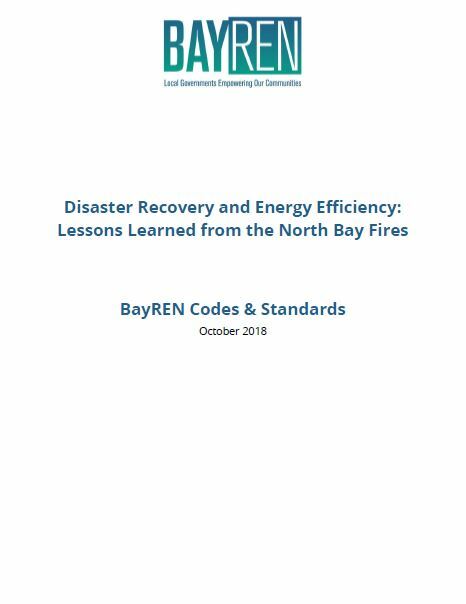 After the North Bay Fires of 2017, the Bay Area Regional Energy Network (BayREN), and especially its representatives from Napa and Sonoma Counties, began thinking of ways to improve energy efficiency and energy code compliance during the rebuilding process. This document summarizes what we did and what we learned from that work, so that others can benefit from our experiences when recovering from other fires or disasters. The intended audience is local government staff, especially those working on sustainability and energy efficiency programs. For more information about anything here, please contact: codes@bayren.org. Incentives are available to help pay property owners in Napa and Sonoma to rebuild homes that are energy efficient, comfortable, and ready to run on renewable energy. Residents of Sonoma County are eligible for incentives up to $17,500; click here to learn more. Residents of Napa County are eligible for incentives up to $12,540; click here to learn more. Current building codes have created healthier, safer homes that resist extreme weather, are more durable, and are less expensive to operate. This sheet discusses measures that can be incorporated into a home’s design to save energy while better withstanding whatever comes its way. Building Envelope – High performance windows and well-insulated walls and attics will provide more comfort inside your home and reduce noise. High performance windows are often fire rated, meaning they can withstand high temperatures and add protection to your home. Passive Solar Design – If looking to change the footprint of your home, consider orienting it to use the sun’s energy for heating and cooling. A well-designed passive solar home can reduce or eliminate the need for mechanical heating or cooling. Passive design can save money, provide more comfort, and supply natural lighting during power outages. Solar or Solar Ready – Consider adding solar or designing for future solar installations. Solar panels harness the energy from the sun to provide power for your home while saving money on utility bills. Go Electric! – Ultra-efficient electric appliances (e.g. heat pump water heaters, ovens, ranges, dryers, etc.) can save money, increase your home’s efficiency, and improve safety by eliminating combustion fuels on site. You can ensure your home is ready for 21st century transportation by installing or being ready for a future electric vehicle charging station. Electric appliances and electric vehicle charging are especially worth considering if you are planning to put solar panels on your home. Energy Storage – Solar panel systems paired with batteries creates the greatest resiliency. Battery backup can be used in emergencies for refrigerators or for select lights and outlets to continue charging cell phones, laptops, and/or power emergency medical equipment. If not ready to install energy storage systems now, consider dedicating space to allow for future installations. Water-Use Efficiency – Many water-saving measures will also save energy and lower bills. Consider installing high-efficiency fixtures, clothes washers, and toilets. Rainwater and greywater systems can also help, as well as carefully designed low-water landscaping. Accessory Dwelling Units – An accessory dwelling unit is a small permanent home in addition to the main house on a residential property, often called a granny unit. These can provide extra space or rental income, and because of their small size can also be very energy efficient. Green prefabricated units are available from several companies. Advanced Energy Rebuild Sonoma and Mendocino Counties | Provides incentives up to $17,500 per home to rebuild an efficient, sustainable home for those affected by the October 2017 firestorms. Advanced Energy Rebuild Napa County | Provides incentives up to $12,540 per home for energy efficiency measures and electric technologies to homeowners in Napa County who are rebuilding due to the fires. Rebuilding for Efficiency, Comfort, and Resilience Consultations |The County of Sonoma’s Energy and Sustainability Division offers no-cost consulting with on-staff energy analysts and help with developing a plan to make your new home as green as possible. Also reviewed are the building requirements needed to access rebates and incentives. Free, Easy-to-Permit Landscape Design Templates |Eight scalable front yard landscape design templates are ready-to-permit and in compliance with local Water Efficient Landscape Ordinances. Rebuild Green Expo | Useful articles and educational presentation slides are available online. Sonoma County Recovers | Guide to help recover after the Sonoma County wildfires. Napa County Rebuilding | Fire recovery and rebuild information from County of Napa. Napa Communities Firewise Foundation |Information on defensible space, fire safe landscape design, and fire hardening.